Colias - named after a genus of butterfly - is an open-platform system that can be used to investigate collective behaviours and be applied to swarm applications. Robotic swarms that take inspiration from nature have become a topic of fascination for robotics researchers, whose aim is to study the autonomous behaviour of large numbers of simple robots in order to find technological solutions to common complex tasks. Due to the hardware complexities and cost of creating robot hardware platforms, current research in swarm robotics is mostly performed by simulation software. However, the simulation of large numbers of these robots in robotic swarm software applications is often inaccurate due to the poor modelling of external conditions. Colias was created by a team of scientists led by the University of Lincoln, UK, with Tsinghua University in China. It has been proven to be feasible as an autonomous platform - effectively replicating a honeybee swarm. Its small size (4cm diameter) and fast motion (35cm/s) means it can be used in fast-paced swarm scenarios over large areas. 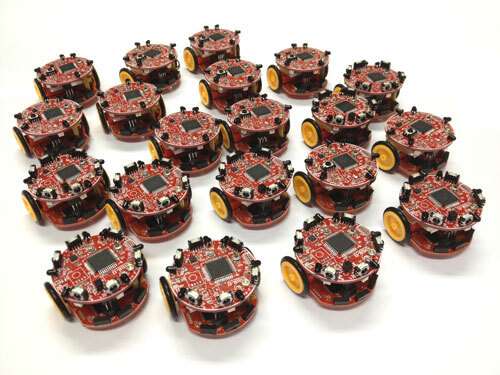 In comparison to other mobile robots which are utilized in swarm robotic research, Colias is a low-cost platform, costing around £25, making the replication of swarm behaviour in large numbers of robots more feasible and economical for researchers. Farshad Arvin, from the School of Computer Science, University of Lincoln, was part of the research team which developed Colias. 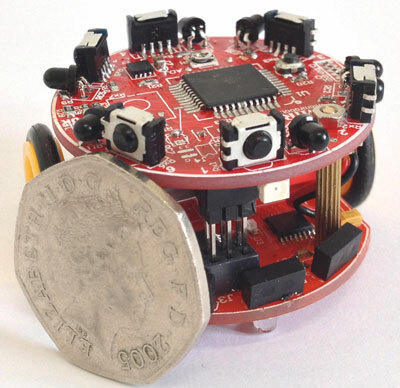 Long-range infrared proximity sensors allow the robot to communicate with its direct neighbours at a range of 0.5cm to 2m. A combination of three short-range sensors and an independent processor enables the individual robots to detect obstacles. A similar but more complex mechanism has been found in locust vision, where a specific neuron called the ‘lobula giant movement detector’ reacts to objects approaching the insects’ eyes. Co-author Professor Shigang Yue, also from Lincoln’s School of Computer Science, previously created a computerised system which supports the autonomous navigation of mobile robots based on the locust’s unique visual system. This earlier research, published in the International Journal of Advanced Mechatronic Systems (2013), could provide the blueprint for the development of highly accurate vehicle collision sensors, surveillance technology and even aid video game programming. The next step for the Colias research team is to work on an extension of the vision module using a faster computer processor to implement bio-inspired vision mechanisms. Full details of their research have been published in the International Journal of Advanced Robotic Systems ("Colias: An Autonomous Micro Robot for Swarm Robotic Applications"). The work is supported by the European Union’s FP7 project EYE2E, which aims to build international capacity and cooperation in the field of biologically inspired visual neural systems.